Yesterday GM unveiled starting prices for their base, mid-grade, and, range-topping trims of the 2015 Chevrolet Colorado and GMC Canyon. Stacking them up next to their "mid-sized" rivals (the Nissan Frontier and Toyota Tacoma), pricing looks pretty competitive. *Some say the Tacoma TRD Pro is above Toyota's "top trim" and not a direct comparison here. If you like, sub it for a Tacoma TRD Sport Extra Value Package which MSRPs to $32,860. Keep in mind the prices here are "bases," but at trim levels that looked close as possible across the board. With only base MSRP of these three GM configuration, we can't do a direct comparison across the lineup yet. Nor can we do a full cost of ownership analysis without fuel economy estimates on the Colorado or Canyon. 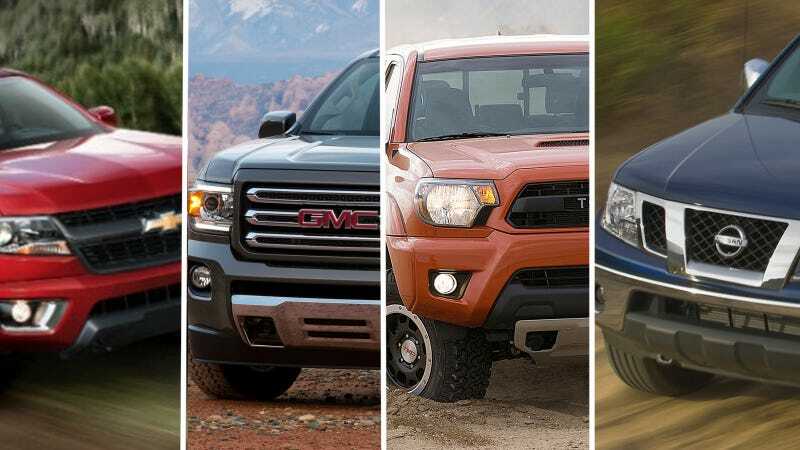 Other things to note; the Tacoma appears to be the only truck in this list that's got a regular-cab (true two-door) option (not discussed because there's no Colorado/Canyon single cab). Also, GM only provided a price on the GMC Canyon SLE in "extended cab" which makes this chart a little more imperfect. While the front page of Nissan's website put their Frontier "starting at" $17,000-something, and Toyota's claims "$18,000" on the Tacoma, that changes as soon as you open the configurator... we'll have to dig a little harder to figure out how you can get one of their trucks that cheap. What jumps out at me is the downright excellent volumetric efficiency GM is juicing out of their V6, which is significantly smaller than the level-up option from their Japanese rivals. No torque figures from GM yet, but it looks like they're leaving Toyota's V6, hacking out a paltry 236 horsepower, in the dust. Better hope that TRD exhaust in the TRD Pro package adds all kinds of muscle. Do these comparisons change anyone's opinions about the Canyon or Colorado price point? Any particular factor you'd like to see torn apart in greater detail?